It’s the marathon we’ve been considering but it’s raised some hurdles en route, even as we seem to have risen above them without skinning our knees. 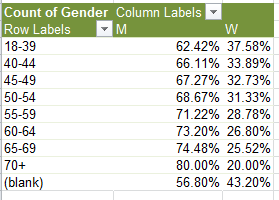 And now that we’ve handcrafted our gender variable –to look back at one of those hurdles – we might as well mix it in a pivot table or two with some other ingredients, and season to taste. We could, for example, see what we shall see about the distributional relation between gender and age category, as our data understand that latter attribute, e.g. 55% of the competitors converge inside the 18-39 bracket, with no drill-downs in sight. To coin a phrase, you can’t always get what you want. 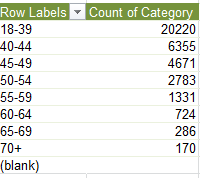 And note the invisible count for blanks, because by definition category-less records have no data to count. But what about a gender proportioning of the runners by age? The story angle’s all yours, journos. 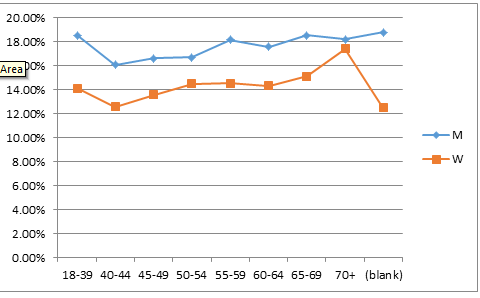 And while we’re at it, what about split differences reckoned by age and gender? That’s interesting too. Women match their marathon halves more closely than men across the age gamut; and how that might square with women’s relatively slower times is something to be thought through. This one’s for you, sports physiologists. And once that reformation is effected a simple RIGHT procedure shaves each entry’s last three characters, and brushes them into the Country field. That one seems to work. The formula asks if the final character in the F cell data is that closed parenthesis. If it is, proceed with the first expression as we detailed it above. If it isn’t – that is, if the closed parenthesis sealing off the country code has gone missing – look to the H column instead and execute the RIGHT/SUBSTITUTE routine there; and you could finalize the process by putting a Paste Special > Values through its paces to cut back on the byte count. And now you can break out the numbers and names by country, too. The pound signs won’t be relieved by a column autofit; rather, they hint at a mathematical impossibility of sorts. Because the numbers in effect express chronological time-of-day data, an outlaw consequence of the time format (see last week’s post), negative splits – in which second marathon halves are run more quickly than first –register an inexpressible negative time of day. You can’t have that in this cosmology, and hence the pound signs. If, however, you format the column in standard Number terms, actual usable negative numbers emerge. Just one of those spreadsheet things. And here’s something else to look at. 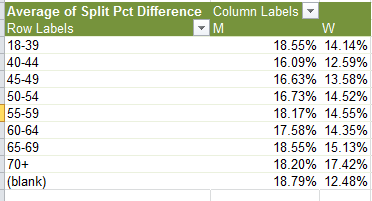 If you sort the data in the Split Pct Difference row smallest to largest – thus heading the column with the runners whose second halves were comparatively the fastest – the splits get rather interesting, starting with Makaela Alison Papworth, a woman whose 30,579th-place finish belies her first split of 4:00:02, a mere warm-up for a second half of 1;28:38. And if you can’t explain that 63% reduction neither can I. Let’s hope the race officials did. And then there’s Jason Scotland, he of a first split of 2:45:15 and a second of 1:19:09. And if that sounds dodgy consider that Mr. Scotland, running in this year’s marathon as Scotland-Williams, appears to have smashed that personal best, breaking out times of 2:07:05 and 1:01:42 – the latter hurtling him into world-record territory. But in between – that is, in the 2013 race – he checked in with splits of 2:24:09 and 4:59:45. Have we reached the limit of the benefit of the doubt, yet? What do you think, Ms. Papworth?